Did you know there are different names for desserts depending on their toppings? For instance, a crisp is topped with a streusel-crumb mixture, a.k.a. magic. And a buckle is a type of crumb cake that cracks and “buckles” as it bakes. No joke. And a betty is layered with cubed bread or breadcrumbs. Amazing. Cobblers are defined by their buttery, biscuity topping (yes, biscuity. New word.) and baked fruit filling. This cobbler, by its very definition, is sweet, tart, fruity and rich with a fluffy, soft, buttery/biscuity topping of… well, biscuits. Biscuits are biscuity. As if you didn’t already know that. And biscuits floating cloud-like atop a juicy fruit filling? Even better. I know it’s roughly 387,273,154 degrees outside right now and the last thing you want to do is turn on the oven, but just do it. 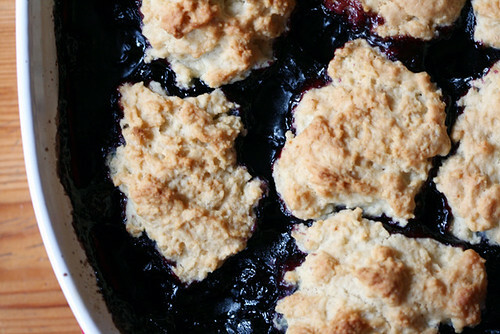 Buckle down, betty up and be sure not to crumble or burn to a crisp before you get that cobbler in the oven. (You like that pun explosion? Took me all day. Or two minutes.) 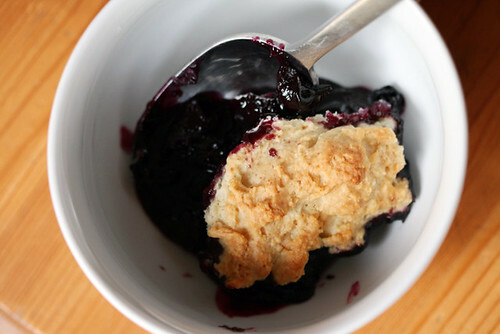 And if you make it that far and are still standing, stash the cobbler in the fridge to cool off, or top it with some vanilla bean ice cream or homemade whipped cream. Or, if you’re living dangerously, eat it warm out of the oven. But for goodness’ sake, drink some water if you do. A girl need not suffer for cobbler. *A note of thanks to one Miss Ashley Moore for her photographic assistance. You light up my life. Preheat oven to 400 degrees F. In a medium saucepan over medium-high heat, combine 3/4 cup sugar, cornstarch and cinnamon and whisk to combine. 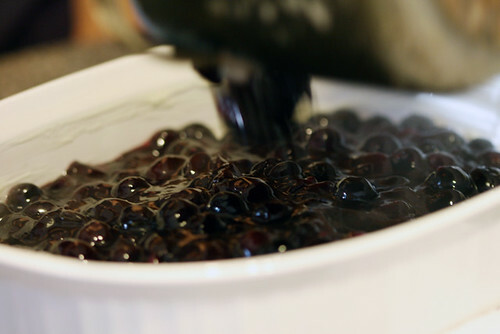 Add blueberries and cherries and stir occasionally until mixture is thickened, about 10 minutes. Remove from heat and stir in lemon juice and almond extract. Pour filling into an 8 x 8-inch baking dish greased with 1 tbsp butter; set aside. In a medium bowl, whisk together remaining sugar, flour, baking powder and salt. 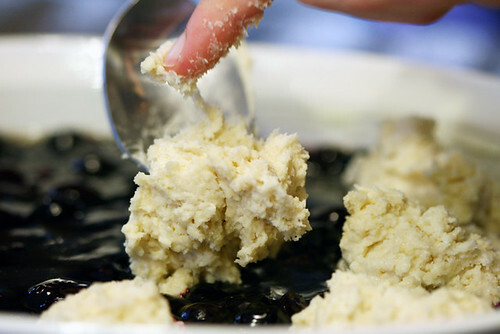 Work in remaining butter with fingers until mixture resembles a coarse crumble. Stir in milk to form a dough. Place heaping tablespoonfuls of dough on top of filling. Bake for about 40 minutes, or until biscuits are a rich golden brown. Serve warm, cold or with your favorite topping. This looks delicious 🙂 Yum! I’m speechless (and drooling) from the gorgeous photos!! This looks fabulous! Love anything with blueberries! Thank you for clearing up my buckle/betty/crisp confusion! 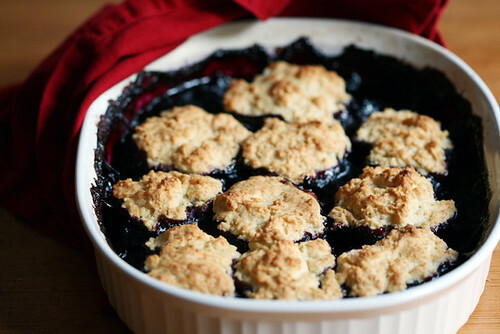 This looks delicious – love the deep colour from the blueberries. Could you substitue the cherry out for frozen strawberries, peaches, or pear? Aubree — Yes, ma’am! All of those sound like perfect substitutes. You said to put the remaining sugar in the topping dry ingredients, however the recipe has no remaining flour. I guessed at 1/2 cup. It is in the oven. I will let you know how it works. Noble — There is no remaining flour; it is only 1 cup total for the biscuit topping. The only thing “remaining” in the recipe is the sugar, and that is whatever is not used in the actual cobbler (aka 1 tbsp sugar). I’m sure you’ll be fine adding an extra 1/2 cup flour to the biscuits, but they won’t be nearly as flaky and tender, unfortunately. I tried it……greattttt!!!!!! My son loved it.